Some places just have a strong sense of identity. For instance, when you see the Gateway Arch, you think of St. Louis. Film making cross your mind? That would be Hollywood. What about fashion and finances? New York City. In recent years, Mississippi has been attempting to create the same identity with good ole down home blues. The state’s Mississippi Blues Trail consists of 117 markers that indicate significant places or people in Mississippi’s rich blues history. West Jackson has a few of its own Blues Trail markers. One is near Jim Hill High & Isable Elementary for blues recording artist, Ishmon Bracey. Another is near the corner of John R. Lynch Street and Valley Street for Blues Hall of Famer, Bobby Rush. 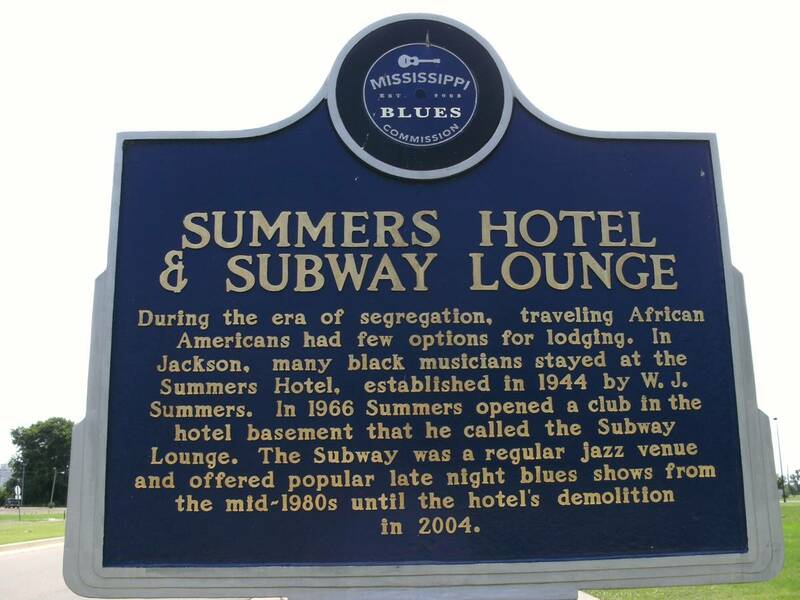 The marker that applies to today’s trivia is the one that pays tribute to the Summers Hotel and Subway Lounge on the Metro Parkway. Summers Hotel was established in 1944 to accommodate African American travelers who visited the capital city during segregation. The two-story, brick structure was located on what was then 619 W. Pearl Street and had a feature that you don’t find too often in Jackson, Miss.–a basement! Out of this basement came the roaring blues and jittery jazz sounds of the Subway Lounge. The Subway Lounge outlasted the Summers Hotel and was a strong nightlife establishment until the crumbling structure in which it was housed was torn down in 2004. The soul of the lounge was still strong as the musicians and its regulars become Saturday night staples at Schimmels Restaurant in Fondren. Vasti Jackson, King Edward, Patrice Moncell, and many others would provide the blues as Schimmel’s bartender provided the booze (okay, I couldn’t resist the rhyme!). These performances, known as Subway Lounge Revisited, lasted until Schimmel’s closed its doors after 11 years of business on May 24, 2010. In Fall 2010, it was reported that the Subway Lounge would be reincarnated as part of Watkins Development Group’s Farish Street Entertainment District. Fingers are crossed hoping this will happen and that the Subway Lounge will be born again to preach the good blues. Thanks for participating in this week’s trivia! If you’d like to see images of the Subway Lounge, make sure to check out the video by film maker Robert Mugge. Mugge also featured the Subway Lounge on the Starz network-aired Last of the Mississippi Jukes.